What is the age range for the Children’s Art Studio? What are the benefits of enrolling young children in art class? At the Children’s Art Studio Inc. we understand the value of engagement in the arts beginning at an early age. In making art, your child will strengthen cognitive aptitude by increasing their communication and problem solving skills. Art making will also promote imagination, creativity and inventiveness in your child while building confidence, competence and self-esteem. Through our various art classes and camps your child will create original and expressive works of art and memories for years to come. Does my child need to have any prior knowledge or experience in order to be successful in art class? Our studio welcomes all children to our classes and camps, no matter the degree of their prior art experience or knowledge. Each of our studio classes are designed around the principle of the building block, where in your child will learn art techniques and processes in a logical progression. Each lesson builds upon knowledge from previous sessions to create a natural progression of understanding and skill. For our more experienced students we challenge them with more advanced exercises designed to expand their repertoire of artistic skills. What type of formal art training do you provide for students? The Children’s Art Studio Inc. is proud to offer your child pioneering and unique art experiences taught by professional teaching and visiting artists through our art classes and camps. Our teachers and visiting artists stem from various art backgrounds and bring with them a wide array of expertise in the field for your child to learn from including: drawing, painting, printmaking, photography/ filmmaking, sculpture, and textile art. As a student in our studio, your child will also use professional caliber materials to ensure an unforgettable art making experience. What skills can my child acquire through art making that will help ensure greater success in their future? What is Kinder Art, and how can the Children’s Art Studio Inc.’s Kinder Art classes help prepare my child for success in school? Kinder Art is the new and exciting art class we offer for children aged three to five. This class is the opportune environment for your young child to experience creative and expressive art making in a safe environment. Our Kinder Art class is also a wonderful way for children to begin building peer relationships that will help make their transition into school an easier process. Kinder Art utilizing your child’s imagination and inventiveness through play in order to encourage their confidence, competence and self-esteem in art making. The Children’s Art Studio Inc. upholds the importance of providing your child with the essential experiences to make creative, original and expressive artwork while participating in our Kinder Art class. 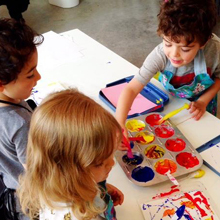 How can I register my child for class or camp at the Children’s Art Studio Inc.? 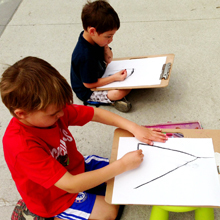 It’s as easy as one, two, three to register a child in any of our extraordinary art classes and camps. As registration on the first day of class is no longer permitted, parents/guardians must register their child in advance. To register your child in any of our art classes or camps please download the appropriate registration form and together with a cheque, snail mail it to our studio. For registration forms and additional payment details please visit our Registration page. How should my child come prepared for class? Do I need to provide a snack? Children should arrive to the studio “dressed for mess.” Although our studio does provide aprons we recommend that children wear comfortable clothing appropriate for mess, because students will be working with various materials that may permanently stain clothing including paint and ink. Additionally, closed toe shoes must be worn in the studio—crocks are ideal. The Children’s Art Studio Inc. provides delicious drinks only, so please pack a healthy and fulfilling snack for your child including a water bottle. We provide various juices, lemonade, organic milk and chilled lemon water. Due to allergies, all snacks must be nut-free. Please inform us if your child has a food allergy or sensitivity at the time of registration, we are happy to accommodate you. How can I find out about upcoming and special events hosted by the Children’s Art Studio Inc? The Children’s Art Studio Inc. is committed to providing children and their families with unique art experiences throughout the year. Be the first to know about our visiting artist program and free family events by joining our mailing list on our home page. Join in the conversations by following us on Facebook and Twitter for immediate updates on all the fun!